Judges in Plateau commence indefinite strike – Royal Times of Nigeria. The judges alleged that judiciary staff and state assembly workers, who were owed similar allowances, were promptly paid, but that the state government singled out Sharia, Area and Customary Court judges and refused to pay them till date. 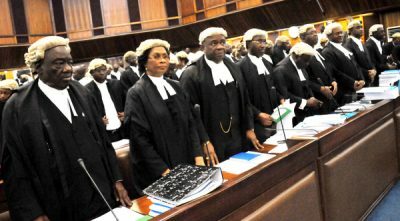 The 140 judges of the Sharia, Area and Customary Courts of Nigeria serving in Plateau State have commenced an indefinite strike over non-payment of dressing allowances owed them since 2009. The judges said they recently gave the Plateau State government a 14-day ultimatum to pay the arrears, but the government did not. Addressing journalists shortly after a closed-door meeting, the chairman of the forum of judges, Ayuba Danzel, said they were left with no option. He said judiciary staff and state assembly workers, who were owed similar allowances, were promptly paid, but that the state government singled out Sharia, Area and Customary Court judges and refused to pay them till date.